She Knits. She Felts. She Dyes. She Collages. Today was the day I got to take a class with Nora Bellows, the wonderful woman behind all of the cool, unique Noni handbags. Since finishing and sewing are not among my strengths, I was really excited about this class. When we walked in, we got to see lots of Nora's sample bags. They were even prettier in person and a little bit intimidating. 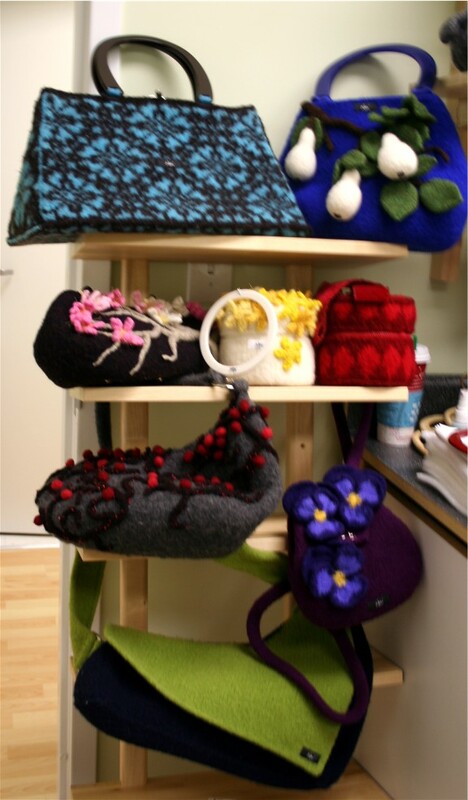 I felt pretty sure I couldn't make my freshly felted bag like as good as the samples. Nora wrote down what everyone was looking forward to learning down on the blackboard at the beginning of the class. 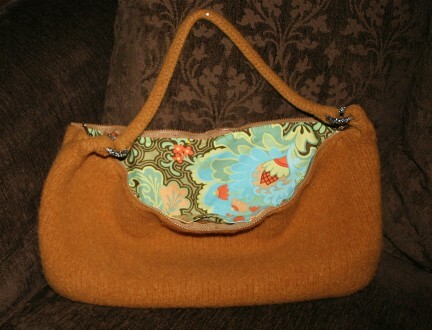 Most of the other women wanted to learn how to make a bag the looked like it was professionally made. Nora characterized the goal as "handmade not homemade." 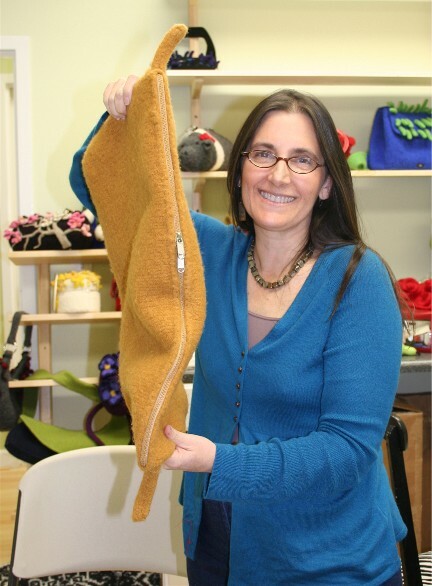 Jaime, one of the staff members at In the Making, the store that hosted the class, brought a cool bag. Like always, she had modified the pattern some herself, using the body from one bag and the flap from another. 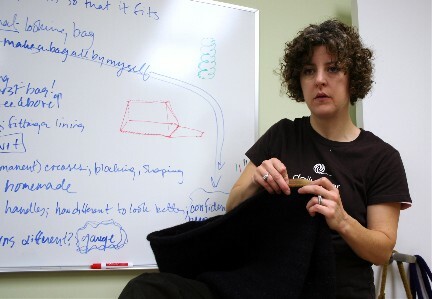 Elizabeth made good use of the lecture time in class, picking up some of Nora's ideas about how to firm up the sides of the bag and line it, while knitting another, really pretty, striped bag. 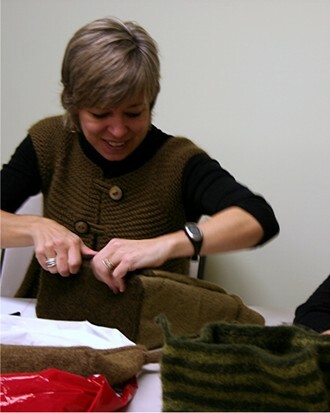 The first part of the class was devoted to stiffening the sides of the bag. It's worth taking one of Nora's classes sheerly to get the benefit of her advice on how to template the inside of a bag so you can interface and line it. Here, Frances is working on sewing together a needlepoint canvas framework that will serve as the support for her bag. My bag, the Noni Adventure bag, is meant to be loose and flopy and doesn't require any stiffening. So the first thing I did, gasp, was put in a zipper ... with lots of help and gudiance from Nora. Remember my bag from yesterday? 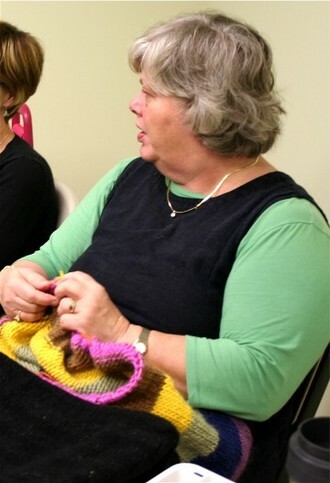 That huge buttery piece of saffron colored knitting? 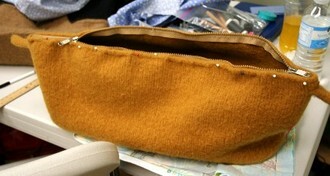 I felted it early this morning and after Nora got her hands on it to help me get the zipper in, it looked like this. I'm pretty proud of that zipper, although it wasn't much more difficult than putting a zipper into a jacket. After learning a lot of tips and ideas, along with watching hands on demonstrations, I really did feel ready to conquer the world of embellished bags. I picked up yarn for a couple more and went on to ballet where I sewed on the hardware and strap and then on home, where I pinned in the lining, although it isn't sewn in yet. Isn't that amazing? It looks better than I anticipated and I feel like I learned so much, although I'm having a hard time keeping my eyes open as I type. If you ever have a chance to take a class with Nora, do! Elliebelly is Reopening. Sign Up to learn more.